For two days (March 4 and March 5, 2013), I live-blogged the NIH Consensus Development Conference on Diagnosing Gestational Diabetes. The purpose of this conference is to come to a consensus on two things: the best way to diagnose gestational diabetes (GDM), and whether we should change the criteria we use to diagnose GDM in the U.S. This blog post covers day 1 of the conference. To read about the information presented on day 2, click here. Note: The information presented in this blog comes directly from the presentations at the conference, and does not necessarily represent my opinion or the opinion of Evidence Based Birth. What implications does the GDM consensus conference have for women and babies? What are the current screening and diagnostic approaches for gestational diabetes mellitus, what are the glycemic thresholds for each approach, and how were these thresholds chosen? What are the effects of various gestational diabetes mellitus screening/diagnostic approaches for patients, providers, and U.S. healthcare systems? In the absence of treatment, how do health outcomes of mothers who meet various criteria for gestational diabetes mellitus and their offspring compare with those who do not? Does treatment modify the health outcomes of mothers who meet various criteria for gestational diabetes mellitus and their offspring? What are the harms of treating gestational diabetes mellitus, and do they vary by diagnostic approach? 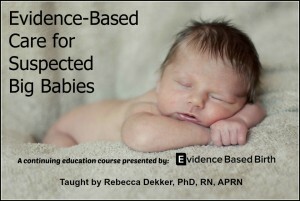 Evidence Based Birth® is now offering you access to an online class where you can learn in-depth facts about suspected big babies. You want to find out details about the class, including information on how you can earn continuing education contact hours. Also, because you found out about the class while reading about the Gestational Diabetes Conference, I will give you a special promotional deal of $5 off! Just use the coupon code “GDMConference” to get your discount! Click here to find out how you can learn more about suspected big babies! Gestational diabetes is defined as a carbohydrate intolerance of varying severity that occurs in about 7% of pregnancies in the U.S. It’s estimated that GDM has an annual economic burden of $636 million in the US. The criteria for diagnosing GDM were established 30-40 years ago. The test for GDM was designed to identify women who were at risk for developing diabetes later in life. It was NOT designed to identify women who were at risk for poor outcomes in pregnancy. Outside the US, the typical test is a 2 hour, 75 gram oral glucose test. In the US, women are given a 1 hour 50 gram glucose test, and if that is positive, then they undergo a 3 hour 100 gram glucose test. Rates of obesity are increasing in the U.S., and so are rates of GDM. When women develop GDM, they are at higher risk for are adverse pregnancy outcomes and long-term negative outcomes for mom and baby. Potential complications of GDM include preeclampsia, higher weight gain in the fetus, and an increased risk for C-section, newborn complications, and of the mother developing Type II diabetes after pregnancy. Controversy #1: Screening: It’s very controversial whether we should screen all women or just women at higher risk. The U.S. Preventative Health Service does not recommend routine screening (2008), citing insufficient evidence for this practice. This group has met again and will be coming out shortly with a new recommendation on screening. Controversy #3: New Criteria. The International Association of Diabetes in Pregnancy Study Group and the American Diabetes Association have recommended new criteria for diagnosing GDM. These criteria are based on pregnancy outcomes, and the cut-offs were defined by the risk of a woman experiencing adverse outcomes. But if these new criteria are adopted, it will double or triple the number of GDM diagnoses to 1 in 5 women, or 18%. This will cost an extra $2.5 billion annually. But there is NO evidence that treatment of these new GDM diagnosis thresholds will improve outcomes. The other clinical trials (mentioned in #2) only looked at treatment of women using the OLD criteria. This conference will NOT state whether or not screening should occur. The conference is also NOT going to cover GDM management and treatment options. The conference WILL address these 2 questions: What should the diagnostic threshold be? And should the current diagnostic criteria be changed? Epidemiology is the study of how diseases are distributed across populations. It looks at the burden of disease, as well as causes, risk factors, prognosis, and the effectiveness of treatment and prevention strategies. Using hospital discharge codes, the percentage of pregnant women who have been diagnosed with GDM has risen from 3.3% in 1998 to 5.6% today. Currently, GDM affects about 200,000 women per year in the U.S. The new birth certificate also has a place to enter GDM. Using birth certificate data, researchers found that in 2008, 4.1% of babies were born to mothers with GDM. Although these data make it seem like GDM is increasing, it is very difficult to tell whether the increase is due to an actual increase or due to changes in screening. In fact, the frequency of GDM really depends on how it’s diagnosed. If you have different cut-points, you will have different numbers of diagnoses. In looking at population data, we rarely know what test or what cut-off people used to diagnose GDM. In some studies, where we know what test people used to diganose GDM, the rates of GDM have remained stable. There is a clear dose-response effect related to obesity and GDM. In other words, the higher your body mass index, the more likely you are to develop GDM. About half of all cases of GDM are thought to be caused by overweight and obesity– but this statement assumes that obesity is a cause of GDM. In Dr. Callaghan’s opinion, there is strong evidence that obesity is a cause of GDM. What happens after pregnancy? Anywhere from 20-50% of women with GDM will eventually develop Type II Diabetes. Increasing evidence shows that we need to pay attention to these women in the post-partum time period. But only half of women with GDM are tested for diabetes after pregnancy. In summary, it appears that the percentage of women with GDM in the U.S. is 5-6%. The trend has been for GDM to increase, but it seems like the increase has leveled. On the other hand, more women have Type II Diabetes in pregnancy. The new cut-off points proposed by the International Association of the Diabetes and Pregnancy Study Groups (IADPSG) and the American Diabetes Association will result in a dramatic increase in the number of women diagnosed with GDM. There are many different ways to diagnose GDM. Some professional and government groups recommend a 75 gram glucose test, and some groups recommend a 100 gram test. There are also different cut-offs for these tests at different time points in the test. To make matters more confusing, some organizations recommend a 1-step process for diagnosis, while others recommend a 2-step process (a screening test followed by a diagnostic test). In the U.S., the most common criteria are based on the original “O’Sullivan & Mahan” criteria. To help us understand this, the speaker covered some basic history about diagnosing GDM. So what is the history about the diagnostic test for GDM? Gestational diabetes was first written about in 1882. In 1952, it was first recognized that there may be poor outcomes associated with GDM. In 1964, O’Sullivan and Mahan proposed that pregnancy changes the metabolism of carbohydrate, and that these changes are different than what happens outside of pregnancy. They published a study with 752 women who took a 100-gram 3-hour glucose test in the 2nd or 3rd trimeste. In this study, the researchers tried out different cut-offs for GDM. O’Sullivan and Mahan followed these women for 20 years, and about 63% of the women with GDM developed Type II diabetes, compared to 5% of women who did not have GDM. Twelve years after this research was published, Williams’ Obstetrics included the O’Sullivan & Mahan criteria in their textbook. Two years later, in 1978, ACOG recommended these criteria as well. A woman is given a 100 gram 3 hour test. If 2 or more of these values are met, then she is diagnosed with GDM. A woman takes a 100 gram 3 hour test. If 2 or more of these values are met, then she is diagnosed with GDM. In 1991, researchers held a 3rd International Conference on GDM. They came to a consensus was that there was a major problem with diagnosing GDM, because different criteria were being used all around the world. Also, these criteria were not based on pregnancy outcomes, but on the risk of developing Type II Diabetes after pregnancy. In 1994, ACOG recommended using either the Carpenter and Coustan criteria or the NDDG criteria. In 2011, the American Diabetes Association recommends new criteria from the International Association of Diabetes and Pregnancy Study Group (IADPSG). These are the criteria that this consensus conference is about– should we adopt these criteria, or not? In the meantime, ACOG continues to recommend the Carpenter & Coustan or NDDG criteria, and ACOG does NOT recommend the IADPSG criteria. A woman takes a 75 gram 2 hour test. If she has one value at or above the cut-off, then she is diagnosed with GDM. **These cut-offs aren’t that much lower than the other ones. The reason the number of women who will test postive will triple is because you only need ONE positive value to be diagnosed instead of two. What about the 50-gram 1 hour screening test? In 1973, O’Sullivan described the 50-gram, 1 hour screening test. Carpenter & Coustan converted the numbers to meet current blood testing standards. The cut-off was 143, but this was not sensitive enough. So they proposed 2 new cut-offs: either 130 mg/dL or 140 mg/dL. In 1986, ACOG recommended the 50-gram 1 hour screening test for women at risk (this was based on the opinion of experts and not based on research evidence). In 2001, ACOG recommended the 50 gram 1 hour test for ALL pregnancies except for perhaps women who are at very low-risk for GDM (<25 years, normal weight, among other criteria). The newly recommended IADPSG criteria are actually somewhere in the middle between other organizations and actually have a higher cut-off than the World Health Organization’s recommendations. If the IADPSG criteria were adopted, the biggest change would be the transition from TWO elevated values to ONE elevated value. In the landmark HAPO study, 64% of women were diagnosed based on a single elevated value rather than 2 elevated values. So that’s the big change that has been proposed– that all women would take the 2-hour test, and if there is one elevated value, then that equals a diagnosis of GDM. Gestational diabetes and can be an ongoing cycle for mothers and infants. Infants may have short-term adverse outcomes such as accelerated growth, while mothers can have increased amounts of postpartum weight retention. In the long-term, infants are at higher risk for childhood and adult obesity, and women are at higher risk for future diabetes and increasing body mass index. The criteria for diagnosing GDM are evolving, because our goal is to reduce adverse outcomes in women and infants. As previously stated, the Carpenter & Coustan diagnostic criteria consists of a 100 gram 2 hour test. If there are 2 or more positive values, then a woman is diagnosed with GDM. The newly proposed criteria consists of a 75 gram 2 hour test, with NEW cut-offs. Only one elevated level would be needed to diagnose a woman with GDM. The HAPO study found that many women have diabetes but are not recognized as being diabetic. Also, they found that glucose levels below the current cut-off are associated with higher birth weights and metabolism alterations in the infant. But the main issue is that this will increase the prevalence of GDM from 5-7% to 18%. This is a three-fold increase in the number of women who will be diagnosed with GDM. Why the controversy? Well, different people have different perceptions of harms and benefits. And there are major concerns about implementing this, and about our healthcare systems ability to absorb this change. How do we implement this in the “real world?” Let’s look at the concerns of the major stakeholders: the 4 million US women giving birth each year, care providers, and diverse clinical settings. Stakeholder #1: Concerns of Women. With regard to psychosocial problems, there is limited evidence on this. One study suggested that women with GDM who are treated have lower rates of depression than women who have GDM and do not receive treatment. But so far that is the only data we have about psychosocial issues. Finally, labor induction usually occurs at 39 weeks of pregnancy in women with GDM, and C-section rates vary widely across settings. Physicians may be more likely to make decisions that lead to a C-section because of concerns about fetal status. Stakeholder #2: Concerns of care providers. More appointments would be needed for a larger number of women with GDM. It would take more time to assess and manage patients’ glucose levels. Clinics would need to staff more people who could provide nutritional counseling and diabetes education. If we are going to have an ever-increasing number of women with this diagnosis, then we will need new tools and ways for care providers to care for these women. Another issue is that only about half of women with GDM are screened for GDM 6-12 weeks after giving birth– these numbers need to improve. This screening requires a fasting state and good patient-care provider communication. Other questions that concern stakeholders: Should we be developing models of care to improve lifestyle habits after delivery? Should we consider extending the perinatal period to 6 months to 1 year after delivery so that we can follow and manage these women who are at higher risk for developing Type II diabetes? How can we get informed, active patients and educated healthcare providers? How would we get the word out about the change in screening? How do we deal with increased laboratory workload? What will this do to C-section rates? Are there potential harms with over-treatment? Will this take more resource utilization? How can we move forward with patient-centered care during pregnancy and beyond? Dr. Hartling and Dr. Donovan conducted a systematic review on the evidence for this topic. They combined the data from different studies using meta-analysis, where appropriate. They looked at primary research studies published in English from 1995-2012, in which women diagnosed with GDM received no treatment. They ended up looking at 38 studies (14 in the U.S.). Most studies used the Carpenter & Coustan criteria to diagnose GDM. If women were diagnosed with the IADPSG criteria, they were 2 times more likely to have a large baby. If they were diagnosed witih the NDDG criteria, they had a 2.5 times higher risk of having a large baby. The Carpenter and Coustan criteria had a 1.6 risk ratio, and the World Health Organization criteria had a 1.3 risk ratio. All of the different diagnostic criteria were able to identify women who were at significantly higher risk for shoulder dystocia. Using the NDDG criteria, women were 6 times more likely to have shoulder dystocia, compared to 1.5 risk ratio using the IADPSG criteria, and there was a 2.9 risk ratio using the Carpenter & Coustan criteria. For C-sections, all of the different ways of diagnosing GDM were associated with a 1.2-1.4 higher risk of having a C-section compared to women who did not have GDM. There was no difference in infant mortality for women with GDM compared to women without GDM. This was consistent using all of the different criteria for diagnosing GDM. Dr. Catalano’s theory is that there is an underlying factor that women begin pregnancy with that is what leads to GDM and future Type II DM. In other words, having GDM doesn’t cause you to have Type II Diabetes later… you already had that risk to begin with, before you got pregnant. The HAPO study (the largest study to date on GDM) found that there was a continuous relationship between glucose and higher infant weights, preeclampsia, and several other outcomes. Other researchers have found that by 12 months post-partum, 18% of women with GDM progressed to pre-diabetes or Type II diabetes. So what are the risk factors for progressing to Type II diabetes after GDM? One study found that there are some statistically significant risk factors, but they are not clinically significant. For example, women with GDM who progress to Type II diabetes are more likely to have a blood pressure that is 3 points higher than women who do not develop Type II diabetes, but that is not a clinically different finding. Another study found that factors associated with progression to pre-diabetes included higher fasting glucose, insulin use during pregnancy, and an earlier diagnosis of GDM during pregnancy. Surprisingly, body mass index was not a predictor of progression to pre-diabetes after pregnancy. One group of researchers followed women for 7 years after they had a GDM diagnostic test. Some women had normal results, others had one abnormal value, and others had 2 abnormal values and qualified for a diagnosis of GDM. There were no significant differences between the women who had 1 abnormal value and those who had 2 abnormal values– these two groups were at equally high risk for developing pre-diabetes 7 years later. What is the benefit of knowing a woman’s risk for developing Type II diabetes after GDM? Well the benefit is that you can do something about it. If you know someone with GDM is at risk for developing Type II, they can engage in intensive lifestyle changes that will drastically lower their risk of developing Type II diabetes. Also, studies have shown that treating mild GDM can reduce the mother’s weight gain during pregnancy. In summary, as early as 3 months postpartum, women with GDM are at increased risk for pre-diabetes. Lifestyle interventions can prevent the progression to Type II diabetes. First, Dr. Pettitt summarized the 2 randomized, controlled trials looking at treatment for mild GDM. The first study is the Australian Carbohydrate Intolerance Study in Pregnant Women (ACHOIS). This is a randomized controlled trial of treatment for mild GDM (Crowther et al., 2005). Using the World Health Organization’s diagnostic criteria, 524 women with mild GDM were randomized to treatment or no treatment. The primary outcome was a combined outcome of any serious complication such as stillbirth or neonatal death (number [n] = 5, all in the control group), shoulder dystocia, nerve palsey (n = 3, all in the control group), and bone fracture (n = 1). The other primary outcomes were NICU admission and jaundice requiring phototherapy. Secondary outcomes included birth weight and large for gestational age. What did they find? The researchers found that the rate of serious complications was lower in the treatment group (1% vs. 4%). However, more babies in the treatment group were admitted to the neonatal nursery (71% vs. 61%). Infants born to women in the treatment group had lower birth weights and there were fewer infants who were large for gestational age. Infants in the treatment group were born at an earlier gestational age, and more women in the treatment group were induced. The other big randomized controlled trial was the MFMU trial for treatment of mild GDM. Women (n = 473) were randomized if they were diagnosed with mild GDM based on ACOG’s recommendations for diagnosing GDM. The primary outcome was a composite endpoint of stillbirth or neonatal death (of which none occurred) and serious complications, and secondary outcomes were birth weight, large for gestational age, preterm delivery, and NICU admissions. What did they find? As noted earlier, there were no deaths in either group. There was also no difference between groups with any of the serious complications or NICU admissions. However, the treatment group did see a decrease in average birth weight, percentage of large babies, shoulder dystocia, C-sections, and a combined measure of preeclampsia and gestational hypertension. There was no difference in inductions between the 2 groups. Next, he went on to talk about several observational studies. In the HAPO study, when glucose values were above the threshold, researchers found a host of outcomes that were more frequent in women with GDM. These included high birthweight, preeclampsia, C-section, shoulder dystocia, newborn low blood sugar, and newborn jaundice. Rates of stillbirth or neonatal death were not higher among women with GDM. In another study, when researchers examined body mass index and GDM, more than 20% of women who were obese and had GDM gave birth to infants that were large for gestational age, compared to 10% of women who were obese without GDM. What about long-term follow-up? In the ACHOIS study, they described outcomes of the children 4-5 years later. About 28% of children were above the 85th percentile for body weight. In a normal population you would expect about 15% to be above the 85th percentile. There was no difference in body weight between offspring of the treatment group and offspring of the control group. In the HAPO study, there was no association between maternal glucose during pregnancy and the infant’s weight/obesity at age 2 years. In the ACOG/ADA study, if a woman’s 1-hour 50 gram glucose was <130 mg/dL, then her 3 year old was more likely to have a higher body mass index. There was a positive relationship between the 50 gram 1 hour glucose test and the body mass index of children at age 5-7 years follow-up. The children of women who were treated in this study had less obesity– this is the only study to date to show that treatment for GDM can decrease obesity in offspring. In the Pima Indians study (Petttitt et al., 1991), the mother’s glucose during pregnancy had a direct effect on the weight of children at age 10-14. This effect persisted up through at least the age of 20-30 years in the offspring of these women. Again, Dr. Donovan and Dr. Hartling revealed more results from their systematic review. The review included 5 randomized, controlled trials and 6 cohort studies. The 2 largest randomized, controlled trials drive most of the findings. The ACHOIS study used the World Health Organizatoin diagnostic criteria, and the MFMU study used the Carpenter and Coustan criteria. So although these studies included women with a similar average fasting glucose, ACHOIS study included women with a fasting blood sugar of 74 to 99, thewhile the MFMU study included women with a fasting glucose of 81 to 92. The results of Donovan and Hartling’s meta-analysis showed that there was a 50% reduction in macrosomia (large baby) with treatment for GDM. This means that you would need to treat 18 women to prevent 1 case of macrosomia. Similarly, they found that treatment for GDM resulted in a 50% risk reduction in large for gestational age babies. There was a 60% reduction in shoulder dystocia. But because shoulder dystocia is such a rare event (4%), you would need to treat 50 women with GDM to prevent 1 case of shoulder dystocia. For preeclampsia, treatment for GDM resulted in a 40% reduction in the risk of preeclampsia. The baseline risk for this is 5.5%. You would need to treat 29 women with GDM to prevent 1 case of preeclampsia. There were no data on long-term outcomes for women, so we cannot tell if treatment for GDM improves long-term outcomes. For long-term metabolic outcomes for children, 2 of the randomized, controlled trials found no difference in body mass index or type II diabetes in offspring. The ACHOIS study found no difference in BMI >85th percentile between the treatment and control groups, even though there were fewer cases of large babies in the treatment group. Research is needed to follow-up offspring from randomized controlled trials. Clinical trials are needed to randomize women to different treatment targets, different surveillance frequencies, and different labor and delivery protocols. GDM includes a wide spectrum of women with a wide range of blood sugars and risks. Attention has been paid primarily to perinatal outcomes such as macrosomia (large baby). A recent systematic review and meta-analysis in the British Medical Journal concluded that treatment of GDM is associated with a decrease in shoulder dystocia and macrosomia. However, treatment for GDM did not reduce C-sections. Importantly, the authors of the meta-analysis did not look at preeclampsia or gestational hyperttension in their systematic review. It is important to note that preeclampsia and gestational hypertension are much higher in women with GDM. But many studies have not adjusted for confounding variables such as obesity. Two studies that controlled for confounders found that women with GDM are twice as likely to experience preeclampsia and gestational hypertension. A secondary data analysis from the HAPO study found that women with GDM have much higher rates of preeclampsia and gestational hypertension, regardless of whether they are normal weight or obese. One large retrospective study included more than 1,800 women with GDM and found a dose-response relationship between fasting blood sugar and the frequency of preeclampsia and gestational hypertension. If the fasting glucose level was <95, only 7.5% of women had preeclampsia or gestational hypertension. On the other end of the spectrum, if women had a fasting glucose of more than 126, then 20% of these women had preeclampsia or gestational hypertension. Women with a fasting glucose of more than 126 have a four-fold increase in their risk of preeclampsia. If women have a fasting glucose of 106-115, they have a 2-fold risk of developing preeclampsia. (Yogev et al.) The HAPO study found similar results. In the MFMU study (of which Dr. Landon, the presenter, was the principal investigator), there were similar rates of preeclampsia between women with one abnormal value on the diagnostic test and women with two abnormal values. So the important question is, does treatment of GDM reduce the risk of preeclampsia and gestational hypertension? Both of the large randomized, controlled trials (ACHOIS and MFMU) demonstrated that treatment for mild GDM reduced the risk of preeclampsia and gestational hypertension. In the MFMU study (conducted by Dr. Landon, the presenter), researchers found that treatment for GDM reduced the percentage of women with preeclampsia and hyertension from 13.6% to 8.6%. However, there is little evidence about treating women who had only one abnormal value on their GDM diagnostic test. There was one small study done in 1989– in that study, researchers found that treatment failed to reduce the rate of preeclampsia in women with one abnormal test. Most recently, Bodner-Roy published an article about the odds of preeclampsia in women with and without GDM, using the newly proposed IADPSG diagnostic criteria for GDM. They did not find a significant difference in preeclampsia between women with and without GDM using the new IADPSG criteria. So evidence does not suggest that treating women with the lower glucose values (included in the newly proposed diagnostic criteria) will reduce their risk of preeclampsia. What about C-section rates in women with GDM? Women with GDM consistently have higher C-section rates (24% vs. 17%; pooled data from 5 studies). Physicians are scared of birth trauma and large for gestational age infants, which may contribute to the higher C-section rates in women with GDM. In a study conducted by Naylor et al., there was a clear increase in C-sections in women who are treated with GDM, compared to those who were not treated. Other researchers have consistently reported higher C-section rates in women who are treated for GDM, even though they give birth to smaller infants. This is probably because physicians have a lower threshold for surgery and are quicker to do a C-section if they know a woman has GDM. However, the odds for C-section may change based on body mass index. Obesity independently increases the risk for C-section. There is a synergistic effect between obesity and GDM. If you have both obese AND you have GDM, your risk for C-section goes up even higher. In contrast, the MFMU study found that treatment of GDM led to a decrease in the C-section rate (27% vs. 34%). There is limited evidence (one study from 1989) on treating women with ONE abnormal glucose value and C-section rates. The HAPO researchers found a dose-response relationship between glucose categories and C-section rates. The risk for C-section rate increased with each category. In Dr. Landon’s opinion, lowering the diagnostic cut-off for GDM would probably not lead to a lowering of C-section rates. Dr. Gilman began by giving an overview of the ACHOIS and MFMU clinical trials. Both trials had similar treatments for GDM: dietary counseling, glucose monitoring, and insulin if needed (7-20% of women took insulin). The ACHOIS found that you needed to treat 34 women with GDM to prevent 1 serious perinatal complication, and if you treated 11 women this would lead to 1 additional induction of labor or admission to the neontal nursery. The main finding of MFMU was that there was no change in the primary outcome (serious complications). There was a reduction in macrosomia (large baby) and large for gestational age infants, as well as a decrease in fat mass in infants in the treatment group. Treatment of mild-moderate GDM reduces the risk of preeclampsia, shoulder dystocia, large for gestational age, and macrosomia. The effects on C-section and serious complications are unclear. The HAPO study does not really provide us with info to choose a cut-point for diagnosing GDM. There have been 4 small, randomized, controlled trials that tested a treatment for GDM in women who did not meet the current criteria for gestational diabetes. When these data were combined, there was a decrease in the risk of macrosomia, but an increase in the risk for small for gestational age. An argument can be made for treating lower risk women for public health reasons. Even though the individual risk of bad outcomes is lower in women with lower glucose scores, the overall public health burden is higher. BUT, Dr. Gilman pointed out that we have some experience with doing similar treatments in the cardiovascular field. For example, we started treating people with lower cholesterols with statin drugs, thinking that it would reduce their risk of heart attack in the future. But we have now begun to see increased harms and adverse effects related to this intervention. Dr. Gilman said that there are several ways to approach a problem like this. In the first approach, everyone gets a treatment (For example, everyone gets dietary counseling). In the second approach, everyone is screened, but only those who test positive are treated. Finally, another approach is to selectively screen people who are at high risk, and then treat only those who test as positive. Dr. Gilman’s personal opinion is that raising– and not lowering– cut-points is the way to go in situations like this. Back to the evidence– Hillier et al.’s 2007 observational study found that treatment of GDM may decrease body mass index in the next generation. But we really need a high-quality randomized, controlled trial with long-term follow-up of the offspring. The ACHOIS trial did follow-up the offspring from their study by linking their study data with public health records of body height/weight at ages 4-5 years old. When they followed up on these children, they saw no effect of the intervention on body mass index. If anything, the treatment group had a higher body mass index and more children with body mass index’s above the 85th percentile. Why would you see no effect of the treatment on BMI in offspring? It’s possible that there is a latent period between ages 1 and 4 where you would not see a weight gain that was related to maternal gestational diabetes. It could be that GDM effects weight in early infancy and in later childhood, but not in early childhood. In summary, 2 major randomized controlled trials of mild-moderate GDM have broad agreement on benefits/risks for newborns. But treatment for GDM does not appear to reduce offspring obesity at ages 4-5 years (data from only 1 trial). In their systematic review and meta-analysis, Dr. Donovan and Dr. Hartling looked for evidence of harms of treatment for GDM by combining studies together. The ACHOIS and MFMU trials were the main trials that contributed to the findings. There were no differences in small for gestational age between groups. There were no differences in NICU admissions between groups. Other potential harms were not examined or reported. Women who are diagnosed with gestational diabetes are made up of a wide range of women with unrecognized type II Diabetes, women with pre-diabetes, and women who just happen to fall into the upper end of normal. So the debate is, how many of these close-to-normal women should we include? Where should the cut-off be? By changing the diagnostic cut-off point, this would increase the number of women diagnosed with GDM by two- or three-fold. Dr. Cundy stated that fetal risks in gestational diabetes are largely restricted to women at the top of the pyramid who have undiagnosed Type II diabetes. With women who happen to fall into the the close-to-normal range, many of these fetal risks just do not apply (Cundy et al., 2000; Farrell et al., 2002). By definition, the new women who will be told they have a diagnosis of GDM (based on the new diagnostic criteria) will fall into that low-risk range. Could we decrease development of Type II diabetes in the mother and child? No evidence for this yet. If this does increase the C-section rate, what about the short- and long-term risks related to repeat C-sections? Medicalization of pregnancy: A diagnosis of GDM transforms a normal life event into a disease process, focuses the source of a problem on the individual rather than the environment, and calls for individual medical intervention rather than collective or social solutions. It’s important to note that pregnancy is a time when women are particularly sensitive to their health and they are vulnerable to stress, anxiety, and guilt. Preventive medical interventions in asymptomatic pregnant women should be based on the HIGHEST level of medical evidence, and we don’t have this yet for lowering the GDM diagnostic threshold. This is going to cost a whole lot! Resources will have to be diverted from somewhere else. Where will these resources come from? Whose perspectives matters? Who bears the costs? There was 1 randomized, controlled trial to minimize the costs of GDM (Meltzser et al., 2010). The greatest costs were in the group who had a 75 gram test. The other 2 approaches (screen with 50 gram first, then do a 2-3 hour test) were cheaper. This finding was replicated by several other researchers, who found that the single diagnostic test was more expensive. Is it worth it? (Is it cost-effective?) Should we be spending this money? Will we get a return our investment? Resource allocation is a reality in health care. Spending money on one intervention will decrease money that we could have spent elsewhere. We don’t like to spend money on treatments that barely work. We like to use healthcare dollars to do the most good. Efficient use of healthcare resources saves lives and improves health. Should we treat the patients with only one evaluated value? Well, it does seem that it is marginally cost-effective to treat GDM according to U.S. standards– it costs about $20,000 per quality-adjusted life year. It’s important to note that in the United Kingdom, this would not be considered cost-effective. Also, the evidence showing that treating GDM is marginally cost-effective was based on an assumption that there are maternal benefits to being diagnosed, that women will benefit from this downstream. What if they don’t? If you assume that there is no downstream benefit, then research shows that lowering the cut-off for GDM is NOT cost-effective. So should we treat all these extra women? If a move is made toward the new cut-off, who will be taking care of these women? Dr. Caughey found a few people who are already doing this– at Stanford and in Boston. But nobody would give him any data. Luckily, at Oregon Health Sciences University where Dr. Caughey works, they convened a panel to see if they could move forward with lowering the cut-off. This decision was made in large part because they felt that these women would benefit from nutritional counseling that could only be reimbursed with a diagnosis of GDM. Using the new screening tests, this doubled the number of women with GDM at Dr. Caughey’s university from 5.6% to 11.7% over the course of a year. Translated to the U.S., this means 238,670 new cases per year, which would cost about $120 million/year to treat all these new patients (this is a low estimate). In summary, some evidence suggests using the new diagnostic criteria may be marginally cost-effective, but we need to examine the assumptions of these researchers closely (for example, we can’t assume that lowering the cut-off will lower the C-section rate). Dr. Barth talked about the practical implications of lowering the GDM cut-off. He noted first that timing of the day matters because the test results are different at different times of day. It’s estimated that switching to the new diagnostic test would increase GDM laboratory workload by about 50%. The new cut-off would affect different parts of the U.S. differently. Some geographic areas will be impacted more than others. Dr. Barth then described what prenatal care looks like with and without GDM. 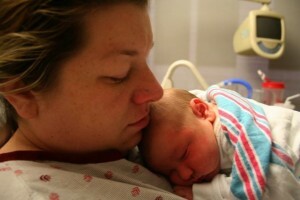 What would happen during labor and delivery? Both the ACHOIS and the MFMU clinical trials had conflicting findings related to inductions and C-sections. It’s possible that these women would see about a 30-40% increase in the induction of labor. In Dr. Barth’s opinion, when a patient’s glucose test results are discussed during report in the labor and delivery unit, this has an unavoidable influence on human decision making. Even if the patient tested negative for GDM, if the clinicians know that the patients had a positive 50 gram test– this will influence their decision making. This is because one of the clinician’s greatest fears is shoulder dystocia, and care providers are very aware of the data showing an increase in shoulder dystocia in these women. In summary, unless accompanied by significant changes in the way we care for patients with GDM, the dramatic increase in numbers of women with GDM will have major implications. It could result in significant increases in clinic visits, prenatal testing, induction of labor, and possibly C-section. If we could somehow limit our number of interventions that we perform on these women, then the lowering of the cut-off could be effective. The only way we can know if this is possible is to conduct appropriately blinded trials, where clinicians are told the patients have GDM or NO GDM.